Andra Vamvu is a graduate of the Faculty of Law, University of Bucharest. 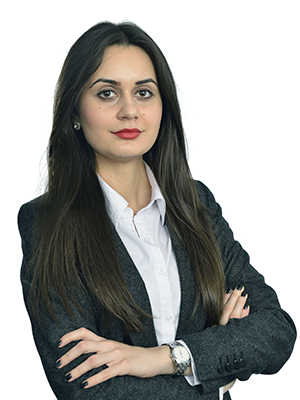 She is a member of the Bucharest Bar since 2011 and is part of our banking team from January 2014. Her fields of expertise include banking, civil, commercial and corporate law. Andra advises one of the most important banks in connection with its activity in Romania, covering regulatory, commercial and civil advice. Her area of practice includes several aspects such as, but not limited to the following: legal advice on debt restructurings, banking transactions, general lending and contracting diverse types of warranties. Legal experience in the energy industry, focusing her practice on regulatory and transactional energy issues. Assisting clients and providing legal advices in connection to the infringement of trademarks. Razvan Dinca & Asociatii was created in 2012 around a group of lawyers who previously achieved international class expertise in specialized areas of practice within one of the most reputable teams on the Romanian market of legal services. Copyright © 2019 Razvan Dinca & Asociatii. All rights reserved.